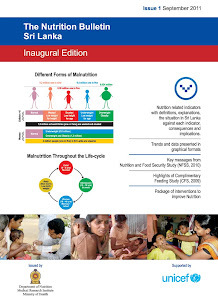 Nutrition Department , of Medical Research Institute, Colombo in collaboration with UNICEF, launched "The Nutrition Bulletin of Sri Lanka". By this quarterly publication we will be providing information about principle nutrition indicators, facts, new knowledge and events to all. The target audience will be medical professionals, policy makers , undergraduate and post-graduate students and anyone who is interested on nutrition status of Sri Lanka. The prime goal of this publication will be to make the scientifically gathered up-to-date nutrition data available , whenever needed. copies of this publication could be obtained by contacting us or you can download it by clicking here. It is a timely need to publish a good resource not only for health sector but for all sectors inorder to make them aware of nutrition and health facts. Our knowledge should be updated specially to educate others in education system. Therefore we must thankfull to all who involved in this great work. I wish you Good Luck. !